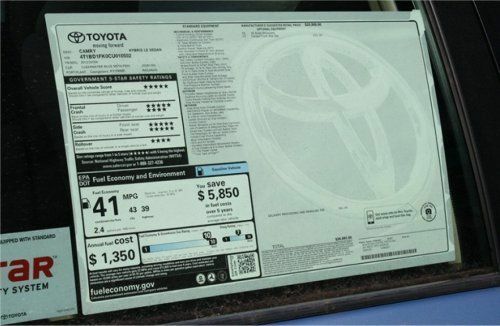 Toyota has released pricing information for some of its top-selling cars, including the 2013 Camry and Camry Hybrid, 2013 Prius c, and 2013 Scion xB. Plus price adjustments for most of its other vehicles, including the Venza, FJ Cruiser, Sienna, Land Cruiser, Sequoia, Highlander, Tacoma and others. Toyota will be adjusting prices on most of its model line by about 0.6%, reflecting higher costs and inflation. Several specific models were given full pricing information, with anticipation of release early next year. The best-selling car in America will see a few updates to go with the slight uptick in price for the new model year. The MSRP for the 2013 Camry begins at $22,235 for the L-grade four-cylinder automatic up to $30,465 for the Camry XLE V6 automatic - a price increase of about $150 from 2012. The 2013 Camry Hybrid will begin at $26,140 for the LE and go up to $27,670 for the XLE - a price increase of about $165 from 2012. The Camry and Camry Hybrid enter dealerships nationally in early January. Model improvements in the Camry line include the L and Hybrid LE trims getting Display Audio as standard equipment. The Camry SE will have Blind Spot Monitor and Rear Cross Traffic Alert available. A new lane-change feature for the turn signal control stalk allows the driver to tap the stalk for a 3-blink burst for lane changes. All Camry models will see updated door trim and leather-equipped models will have updated stitching accents on the door panels. The 2013 Prius c hybrid will receive interior upgrades at all trim levels. The MSRP for the 2013 c begins at $19,080 for the One and climbs up to $23,360 for the 2013 Prius c Four - an average increase of about $130. The 2013 Prius c enters dealerships in early January. The best-selling vehicles in the Scion brand will receive a lot of updates as 2013 is a mid-cycle point for the car. MSRP begins at $17,750 for the 2013 Scion xB with automatic transmission or $16,800 for the standard transmission. This is a $500 increase in both models (2.9% and 3.1%, respectively). With this price increase comes a glut of now-standard features. A new front bumper with integrated LED accent lighting and rear bumper with black diffuser are now standard. Interior changes include light bronze metallic and chrome accents and a new seat fabric. BeSpoke Premium Audio is now available for the 2013 xB and two new colors have been added to the model option lineup. Other Scion vehicles will see a 2013 bump as well. 2013 will see the iQ go up by $110 to $15,495 and the FR-S go up by $300 to $24,500 (MT) and $25,600 (AT), a 1.2% jump for this rear-wheel drive sports car. The FJ Cruiser sees a price increase of about $150 across trims. MSRP starts at $27,030 for the 4x2 automatic to $28,620 for the 4x4 autoamtic. The 2013 Land Cruiser starts at an MSRP of $78,555 ($300 increase). Highlander prices will range from an MSRP of $29,020 for the four-cylinder FWD to $39,400 for the Limited V6 AWD - an increase of $150, or 0.4 percent. The Highlander Hybrid will bump about $150 with its MSRP starting at $40,170 for the V6 AWD to $46,370 for the Limited V6 AWD trim. 2013 Tundra pickup prices will range from $25,455 for the 4x2 Regular Cab V6 to $48,170 for the 4x4 CrewMax 5.7-liter V8 - an increase of $100, or 0.3 percent. All listed prices do not include destination or handling.